What is the cheapest way to get from Champasak to Luang Prabang? 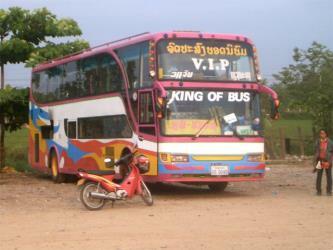 The cheapest way to get from Champasak to Luang Prabang is to bus and minivan which costs $75 - $85 and takes 20h 5m. What is the fastest way to get from Champasak to Luang Prabang? The quickest way to get from Champasak to Luang Prabang is to fly which costs $210 - $550 and takes 2h 25m. How far is it from Champasak to Luang Prabang? The distance between Champasak and Luang Prabang is 683 km. The road distance is 1031.6 km. How do I travel from Champasak to Luang Prabang without a car? The best way to get from Champasak to Luang Prabang without a car is to bus and minivan which takes 20h 5m and costs $75 - $85. How long does it take to get from Champasak to Luang Prabang? 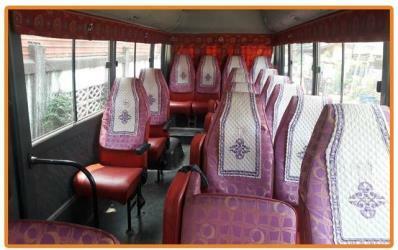 It takes approximately 2h 25m to get from Champasak to Luang Prabang, including transfers. 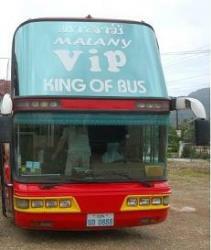 Bus or fly from Champasak to Luang Prabang? The best way to get from Champasak to Luang Prabang is to fly which takes 2h 25m and costs $210 - $550. 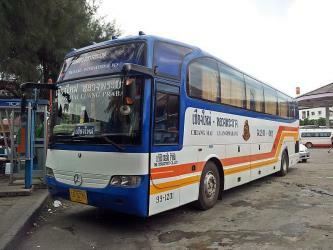 Alternatively, you can bus and minivan, which costs $75 - $85 and takes 20h 5m. How long is the flight from Champasak to Luang Prabang? The quickest flight from Pakse Airport to Luang Prabang Airport is the direct flight which takes 1h 40m. Can I drive from Champasak to Luang Prabang? Yes, the driving distance between Champasak to Luang Prabang is 1032 km. It takes approximately 16h to drive from Champasak to Luang Prabang. Which airlines fly from Pakse Airport to Luang Prabang Airport? Lao Airlines offers flights from Pakse Airport to Luang Prabang Airport. Where can I stay near Luang Prabang? There are 296+ hotels available in Luang Prabang. Prices start at $15 USD per night. 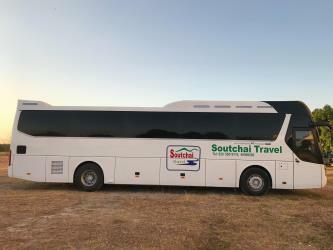 What companies run services between Champasak, Laos and Luang Prabang, Laos? Lao Airlines flies from Champasak to Luang Prabang 6 times a week. Alternatively, you can take a bus from Champasak to Luang Prabang via Pakse Kriangkai Bus and Vientiane Bus Station in around 20h 5m. Rome2rio's Travel Guide series provide vital information for the global traveller. Read our range of informative guides on popular transport routes and companies - including How to get from Heathrow Airport into central London, 5 incredible day trips from Florence by train and How to get from Stansted Airport into central London - to help you get the most out of your next trip. How do I get to Pakse (PKZ) Airport from Champasak? The best way to get from Champasak to Pakse Airport is to taxi which takes 39m and costs $35 - $45. The Royal Palace in Luang Prabang, Laos, was built in 1904 during the French colonial era for King Sisavang Vong and his family. The site for the palace was chosen so that official visitors to Luang Prabang could disembark from their river voyages directly below the palace and be received there. After the death of King Sisavang Vong, the Crown Prince Savang Vatthana and his family were the last to occupy the grounds. In 1975, the monarchy was overthrown by the communists and the Royal Family were taken to re-education camps. The palace was then converted into a national museum. Near Pak Ou (mouth of the Ou river) the Tham Ting (lower cave) and the Tham Theung (upper cave) are caves overlooking the Mekong River, 25 km to the north of Luang Prabang, Laos. They are a group of two caves on the west side of the Mekong river, about two hours upstream from the centre of Luang Prabang, and have become well known by tourists. Wat Manorom is a major Buddhist temple and monastery in Luang Prabang, Laos. There are several theories as to the date of its founding; it may have been founded in 1372 or 1375 by Samsenthai, but it may also date from the reign of Laasaenthai Bouvanaat around 1492. The great bronze Buddha, 6 meters high, in the nave dates from the 1370s. The Kuang Si Falls, sometimes spelled Kuang Xi or known as Tat Kuang Si Waterfalls, is a three tier waterfall about 29 km south of Luang Prabang. These waterfalls are a favourite side trip for tourists in Luang Prabang. The falls begin in shallow pools atop a steep hillside. These lead to the main fall with a 60 m cascade. Rome2rio makes travelling from Champasak to Luang Prabang easy. Rome2rio is a door-to-door travel information and booking engine, helping you get to and from any location in the world. 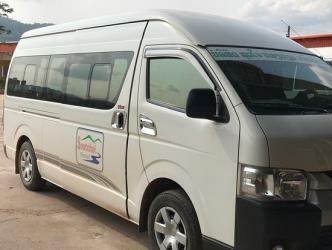 Find all the transport options for your trip from Champasak to Luang Prabang right here. Rome2rio displays up to date schedules, route maps, journey times and estimated fares from relevant transport operators, ensuring you can make an informed decision about which option will suit you best. Rome2rio also offers online bookings for selected operators, making reservations easy and straightforward.